Welcome, my name is James Butler and I’m The DogSmith of Aberdeen. I am an advocate of force-free dog training methods and incorporate this philosophy into all my training and behavior work. My company name in Aberdeen is Barking with Butler – The DogSmith. I offer a wide selection of dog training and behavior services but I am passionate about and specialize in progressive puppy classes, Individual behavioral services and dog reactivity and aggression. I am fully dedicated to my business and each of my training and behavior services. Patience and constancy are my watchwords and a key part of how I help you and your pet to reach your individual goals coupled with my skills and knowledge. I will always put your pet’s welfare first and foremost and am never afraid to take one step backwards to give you or your pet the time you need to consolidate your learning. I am committed to my own education and continually pursue accreditations, course and programs to further my knowledge and practitioner skills. I actively participate in the Pet Dog Ambassador Program and these services are available to each of my clients. I am a Professional Canine Training Technician (CTT-A) accredited by The Pet Professional Accreditation Board and recently became a Certified Fear Free practitioner. 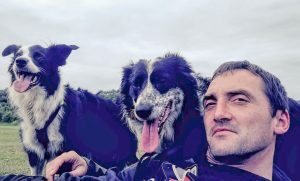 I share my life with two wonderful Border Collies, Swift 7 and Gem 5. Both of my dogs came to me with several behavioral challenges that with patience and love, underpinned by a training and behavior change plan have resolved. Both Gem and Swift are now well-behaved dogs who function well in a family home. We all enjoy playing scent games, trick training and working on distance work using a whistle, they enjoy herding tennis balls instead of sheep! I very much look forward to meeting you and your pet and working with you to meet your goals.